I was initially drawn to The Jewel by its stunning cover. What can I say? I’m a sucker for a book with a gorgeous cover! 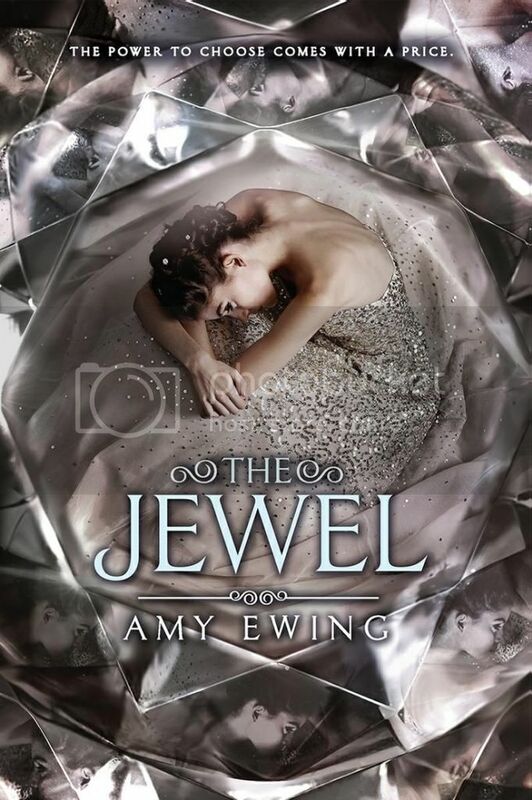 The Jewel has a very intriguing story to go along with its pretty cover as well. In the center of the city is The Jewel, the place where all Royals live. To live in the Jewel means you have money, beauty, and all the things you could ever want, except for the one thing you can never have; offspring. This is where surrogates come in; children that were born in the Marsh that are auctioned off to the highest bidder continue a bloodline. Violet has been trained for years to be a surrogate for Royal, but once the auction is over and her new life begins, she realizes that nothing in her new world is quite what it seems. Violet was an interesting main character. By other people’s standards, she should be proud to be a surrogate, to help the royals keep their linage going. But that’s not what Violet wants at all. She longs for her own life, one where she can live free to do what she wants, and to not live in servitude to the royals. She’s a very strong character, and at times we see her rebellious side come out. I know we are going to see great things from this character in the future. There were some secondary characters in the story that I really loved; the most being Lucien. I really hope that we get to know more about him in the next book. The storyline and world-building for the book is definitely intriguing and creative. It kind of has a familiar plot to a lot of dystopian novels that I’ve already read, but it also seemed to stand out as well in some ways that were really unique. The book ends with a pretty huge cliffhanger; one that has me wondering what exactly this means for the next book in the series. Regardless, I’m dying to find out what’s going to happen with these characters. Overall; I thought that The Jewel was an interesting start to what should prove to be a very fascinating series. I can’t wait to read the rest of the books in this series! Yay, I'm so glad you enjoyed this book! I loved it, too! I agree, the cover is gorgeous and the plot was a bit different from your average dystopian. Great review! I've heard so many mixed reviews about this one, I'm happy you enjoyed it! And yes, that cover IS beautiful! The cover to this one is very good! I know a lot of feedback on this novel has been mixed; some people love it and some hate it. I am not sure where I stand yet!